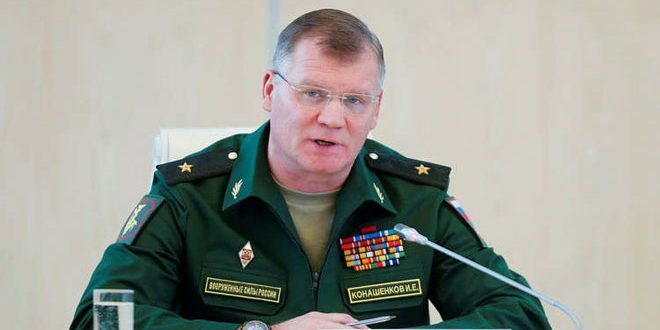 TEHRAN (FNA)- Spokesman for the Russian Military in Humeimim Airbase Igor Konashenkov categorically denied claims that Russian fighter jets have bombed positions of the US-backed Syrian Democratic Forces (SDF) on Eastern bank of the Euphrates River in Deir Ezzur on Saturday. “This is not possible. Why would we bomb them?” Igor Konashenkov was quoted by the AFP as saying on Saturday. A Kurdish media outlet claimed on Saturday that the Syrian and Russian fighter jets targeted positions of the SDF in the Eastern bank of the Euphrates River in Deir Ezzur province in early hours of Saturday. The Kurdish-language Hawar news agency reported that the Russian and Syrian fighter jets hit SDF’s positons in al-Sina’ah region in the Eastern bank of the Euphrates River in Early Saturday, injuring a number of the Kurdish fighters. Hawar news said that six SDF fighters were injured in the air raid, adding that Damascus and Moscow had not reacted to the allegation. The US-backed SDF forces in Syria announced that they would not allow the Syrian government troops to cross the Euphrates River. “Now we have 3 km between us and the Eastern riverbank, once our forces reach the area, any shot fired into that area will be considered an attack on the military council,” Abu Khawla, commander of the SDF-affiliated Deir Ezzur Military Council, said. “We have notified Damascus and Moscow that we are coming to the Euphrates riverbank, and they can see our forces advancing. We do not allow the Syrian pro-government forces to cross to the Eastern riverbank,” he added. Moscow also said Syrian government forces crossed the Euphrates River in their push to liberate the Deir Ezzur Province from ISIL, ignoring a warning by a ragtag group of militants that receives Washington backing. Russian Foreign Ministry Spokeswoman Maria Zakharova added on Friday that the Syrian army was already on the river’s Eastern side. The Syrian army crossed the Euphrates to deploy on the Eastern bank of the river this week. Syria’s al-Watan newspaper reported on Tuesday that the first units of the army deployed on the Eastern bank of the river, spreading towards the regions where a number of SDF claimed to have deployed a day earlier. The Arabic-language daily also stressed that the Syrian soldiers were waiting for portable bridges to move their armored units across the river. The SDF claimed on Monday that a number of its units have advanced over 250 square kilometers in their anti-ISIL operations dubbed as ‘Island’s Storm’, and are approaching the contact line with the Syrian army. The SDF opened a new front in Eastern Syria earlier in September and moved towards Deir Ezzur from the North. The spokesman for international coalition Ryan Dilon reported that since the beginning of the Island’s Storm military operations, the SDF has captured more than 250 square kilometers in Wadi Nahr Khabour region in Northeastern Deir Ezzur. Meanwhile, the SDF media center announced that combat units entered the streets al-Sina’ah (industrial0 region in Deir Ezzur city’s outskirts. Al-Sina’ah industrial region is only 10 kilometers from Deir Ezzur city, meaning that the SDF are now just 10 kilometers away from Syrian troops and their allies if their claims are proved.